Description: Soothe your itchy, scratchy throat and freshen your breath with the spicy, refreshing taste of pure, therapeutic-grade Thieves Lozenges. Nature's perfect design of invigorating essential oils serves as the base of this soothing lozenge, a natural blend for the relief of occasional symptoms of congestion, headaches, sore throat, watery eyes and sneezing. How to Use THIEVES LOZENGES: Dissolve 1 lozenge in mouth as needed. Caution: Swallowing lozenges whole may cause choking. Please note: The "Add to Cart" button is only for retail purchases. 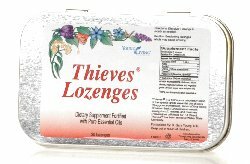 If you want to sign up as a preferred customer (autoship program) or as a distributor, you will need to enroll first and then add THIEVES LOZENGES to your cart. Please see the How to Order page for more details.